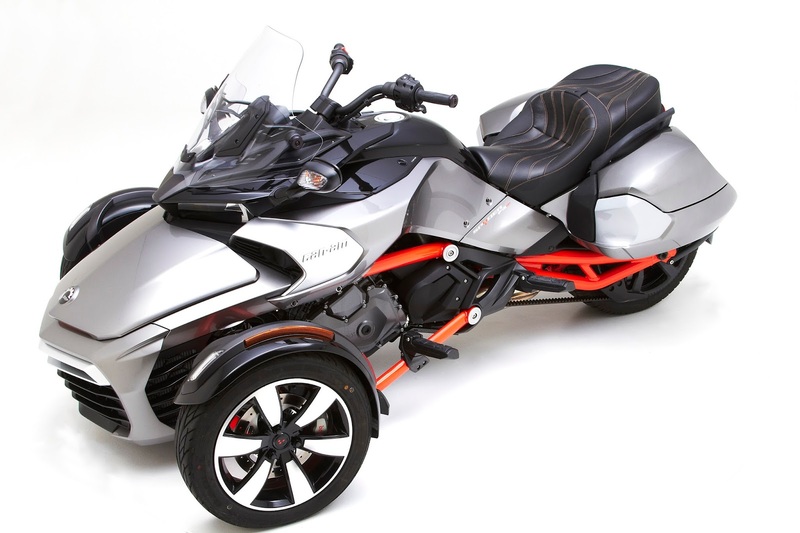 Hollister, CA – Corbin's Fleetliner bags were specifically designed for the Spyder F3 to emulate the visuals of the bike and integrate perfectly. 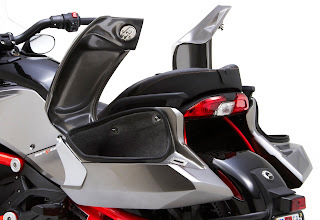 Notice how the lines and details of the stock bodywork has been incorporated into the design of the bags and they give a more balanced aesthetic to the bike? Fleetliner saddlebags are specially engineered for each motorcycle so they fit the profile of the bike perfectly, like pieces of a puzzle. This enables the bags to carry the weight of the contents closer to the centerline of the bike and maintain a good center of gravity. Another benefit of Corbin’s design and mounting system is a smaller overall width for less wind resistance. You won't even notice they're back there when riding and they remain stable at all speeds. Because the Spyder doesn't lean in corners, we were able to make these bags larger than our typical Fleetliner bags...34 liters per side to be more precise. For those not committed to the metric system, that's two and a quarter cubic feet total! the doors are fully weather stripped to keep the rain out if you should be so unlucky as to get caught in a storm. Both bags come fully lined to protect your cargo and the doors feature adjustable locks for security. Installation on the F3 models is fairly simple and Corbin supplies all required mounting brackets. 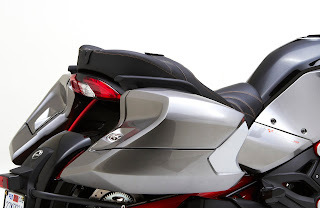 Saddlebags are constructed of Fibertech for durability and a perfect finish and come to you prepainted to coordinate with factory paint. We even paint the rear mounting brackets to coordinate with the F3 chassis! Combined with our saddle system, the F3 becomes a formidable sport touring machine! Remember, although our saddlebags can hold an impressive amount of gear, it is never a good idea to overload your bike. Always conform to the weight limits outlined in your Can-Am owner’s manual to assure your safety. For more information, call 800-538-7035 or online at www.corbin.com. Visit Corbin Headquarters at 2360 Technology Parkway, Hollister, CA. 95023 or Corbin Florida at 1433 US Highway 1, Ormond Beach, FL 32174..